Euclid Beach Park, once located along the shores of Lake Erie east of Cleveland in Euclid Ohio, was a popular turn-of-the (20th) century amusement park and beach, fashioned after New York's Coney Island. Although it closed in 1969, many Cleveland residents count visits to the park as some of their favorite childhood memories. Euclid Beach Park opened in 1894. The park was owned and operated by William R. Ryan, who saw it as an adult park, with a beer garden and freak shows. The Dubley S. Humphrey family purchased the park in 1901 and re-created it as a family resort, with proper attire and behavior required and no beer allowed. 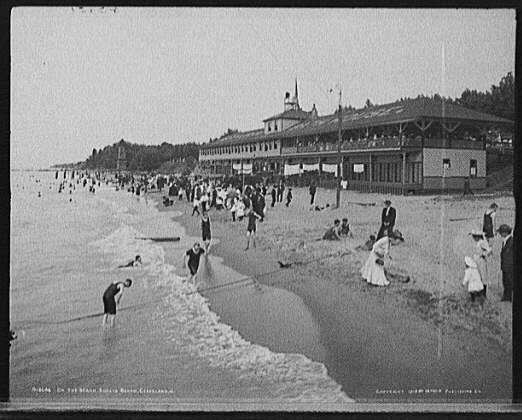 Among the many attractions at Euclid Beach Park were a number of classic roller coasters, landscaped picnic grounds, a fun house, a long pier jutting out into Lake Erie, a dance pavilion, an area for smaller children, and lots of rides. The advent of television and the relocation of many Clevelanders to the suburbs in the 1960s spelled the end for Euclid Beach Park. The former Cleveland favorite closed its gates for good on September 28, 1969. Today, all that remains of the once vibrant amusement park is the Arch that stands guard along Lake Shore Blvd. Declared a National Historic Landmark, the arch is now protected from demolition. Attractions from the Park may be found in and around Cleveland. The "Great American Racing Derby" attraction is now at Cedar Point; portions of the carousel are on display at the Western Reserve Historical Society; and "Laughing Sal," a fixture of the Euclid Beach fun house, can be rented for special events. Euclid Beach Park - A Second Look, Lee O. Bush et. al; Amusement Park Books; 1979.